Picking up where we left off in Siem Reap, we visited the Angkor Wat temple. It is located just outside of Siem Reap- pictures don’t do justice to the immense size and the grandeur of the architecture. 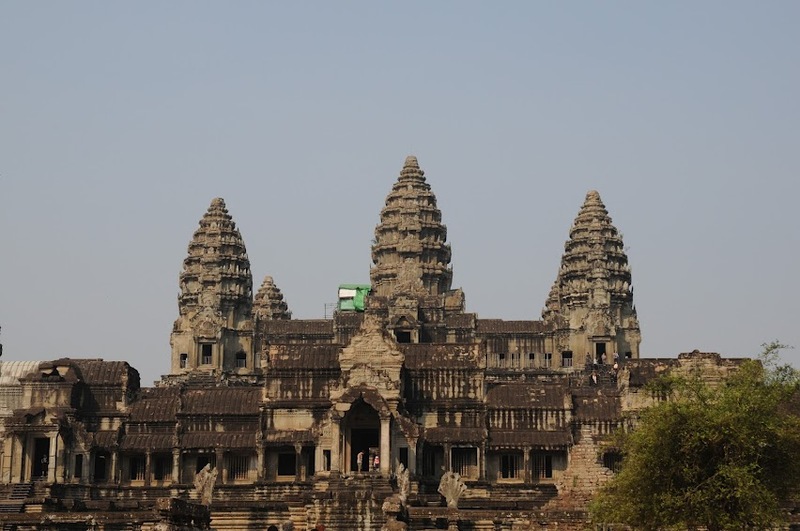 It is the largest Khmer temple complex in the world, built by King Suryavarman II in the early 12th century. The incredible decoration, which is made up mostly of bas-relief friezes and large-scale scenes is something to be seen in person. Even though the temple is Buddhist, the carvings and sculptures are mostly Hindu. After climbing to the top of the center tower and exploring as much as we could of the vast complex, in the short time we were there, we grabbed lunch at a stand in the parking lot. In addition to the usual Khmer dishes, Sky was “kind” enough to order a plate of Beef with Jungle Ants for all of us to share! The group voted it the worst of the bugs we (not me!) had tasted- ants taste like ants, and you can’t say anything else about them. After lunch it was a short ride to Angkor Thom, our next stop, and a much smaller temple than Angkor Wat, but it was just as grand and impressive. We continued our Temple tours with the Banteay Srei temple, known as the Pink Temple, or Women’s Temple because of the pink limestone that it is built from. After a very long and hot day of sightseeing, most of the group went to dinner at The Soup Dragon restaurant, a restaurant that gives 10% of its profits to a local children’s clinic. The Vietnamese style pancake with chicken that I had ordered as an appetizer, could have easily fed two adults for dinner, and was superb. Most of us called it an early night so we could be up early to watch sunrise over Angkor Wat. A very sleepy group of 8 of us got up at 4:30am to get to the temple early enough to capture a prime spot. Walking by the light of our flashlights, we found a great spot on the wall of the Library at the temple where we settled in and waited for the sun to rise. Our guide asked if anyone wanted coffee and took our orders and disappeared into the darkness. A few minutes later a woman appeared caring a silver try with all of our coffees and tea’s and milk and sugar. The sky was overcast so sunrise was a bit of a disappointment. I had hoped for some great pictures, but the experience was worth it, even with the lack of actual sun. We headed back to the hotel for breakfast and to meet up with the late sleepers of the group. Our touring today would take us to the infamous Jungle Temple, where Tomb Raider was filmed and then we’d have a free afternoon around Siem Reap. 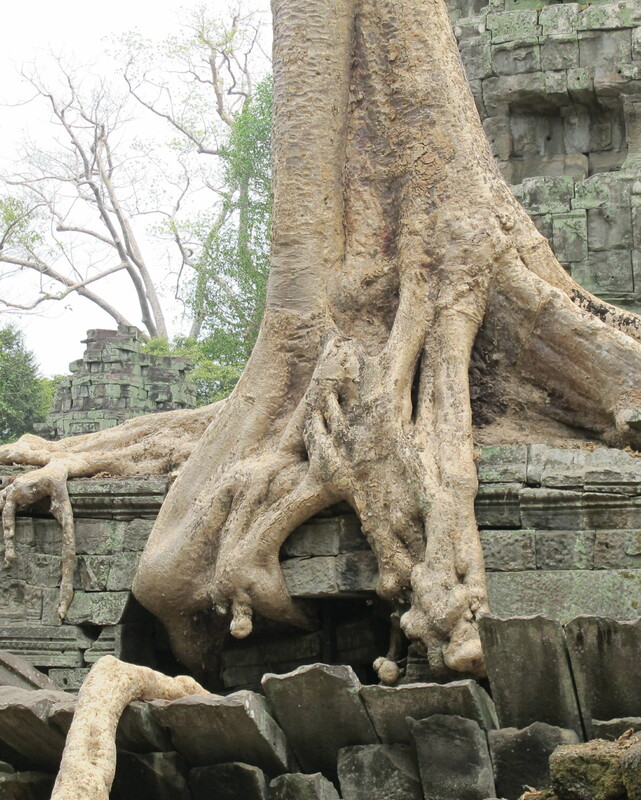 The Jungle Temple was really a magnificent site, with massive trees growing and engulfing the stones. There were literally trees growing directly from the rocks. 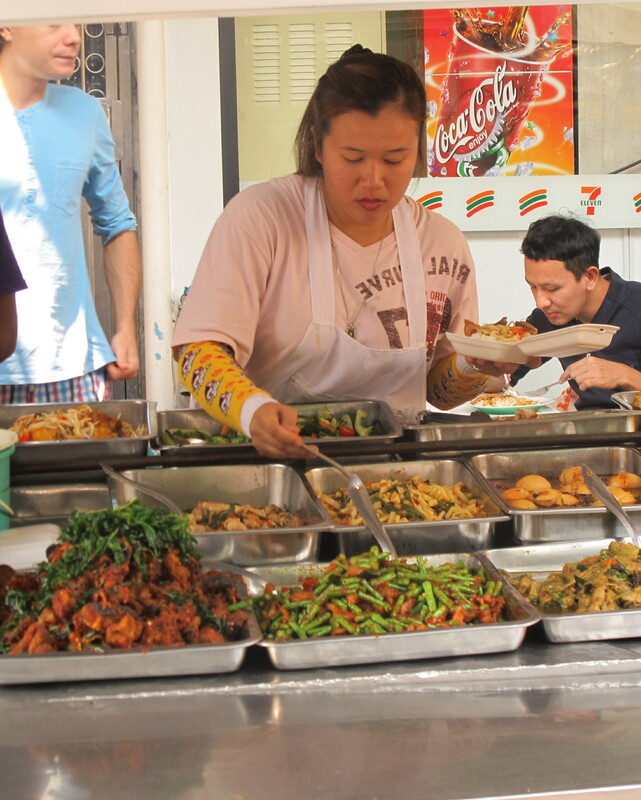 For dinner, Sky had planned to take up to a local street market and then an all you can eat BBQ buffet. 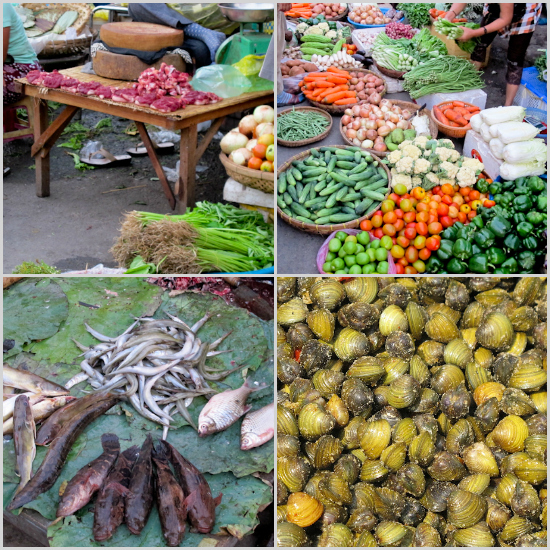 First we walked around the street market where we sampled local fruits, deserts, and other street foods, including the best scallion pancakes I’ve ever tasted. We then sat for a snack at one of the many “cow on a spit” stalls for a few slices before we headed to dinner. Dinner was more of hot pot rather then BBQ. Everything was delicious and you could either cook your meal directly over the heat of the coals in a pot on the table or in the boiling broth that surrounds the coals. The buffet had all of the assorted parts of chicken, beef, and pork, as well as seafood and vegetables. We cooked by dangling the meat over the coals or by poaching it in the broth. Everything was great until about 2:30 am when a wave of food poisoning started passing through the group. I was one of the lucky two people who did not get sick. Because of this we got a slow start and had an easy day. 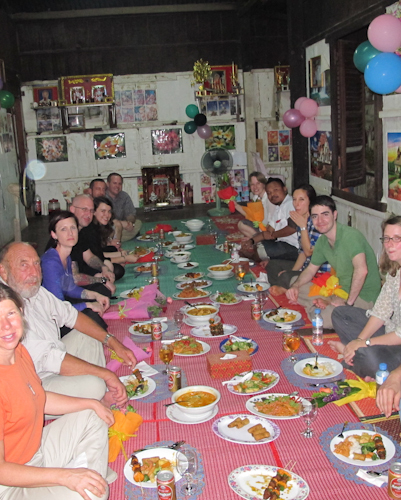 A bus trip to Battambang, with a stop at Sky’s family house was really wonderful. We saw how people actually live in the villages. This was not your typical tourist destination and I am thankful for the opportunity to see how these kind and gentle people live. For a business, his family drives to the Thai border and buys used American clothing then alters them to smaller sizes and resells them to the locals. It’s quite a demanding profession but has been very successful for them. We drove to Battambang where, those of us who felt well enough to eat, went for lunch at Ptea Teuk Dong Street Families Center, where we ate a delicious meal and we learned about their programs here to help abused and homeless women and children. This is one of the aspects I really like about Intrepid Travels. They have a foundation that sponsors charities and humanitarian projects around the world and with each trip they try to make visitors aware of these endeavors. 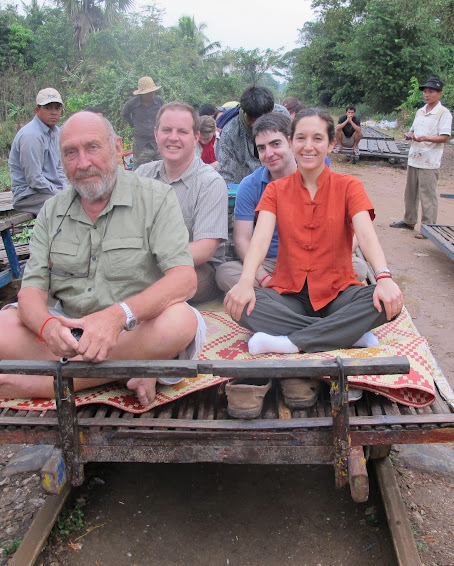 After lunch we took a ride on the bamboo railway. It’s basically a small bamboo platform powered by a lawnmower engine, driven down tracks that were laid by the French in the 1920’s and have not been repaired since. It is only a single track but a 2 way trip! The rule of the road is that which ever direction has less cars, or less people on the cars, has to get off the track to let the other pass. This is not so easy as you have to disassemble your train car and move it off the track and then rebuild it when you can go again. It takes quite some time to actually get anywhere. Dinner that night was at the Gecko Café, another restaurant that teaches people trades by having them work in different positions in the restaurant. Here I had a fantastic Chicken Curry. It wasn’t too spicy but full of flavor. After the long day of travel and many people not feeling well we called it an early night to be ready for the long drive to Bangkok. 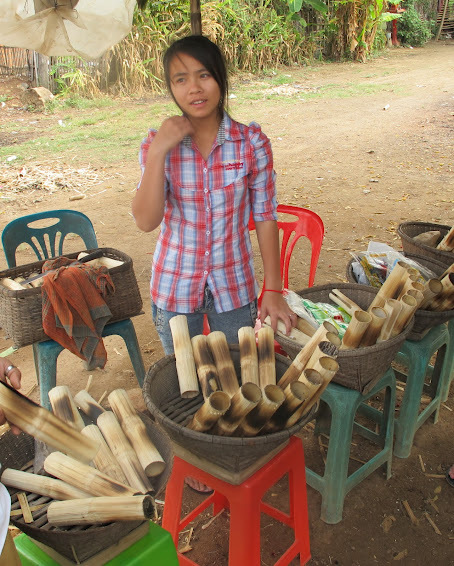 During the 9 hour drive to Bangkok, we stopped along the way for a taste of bamboo sticky rice from a roadside vendor. These rice treats were very popular and quite delicious. The bamboo gives the rice a nice flavor as it is cooked directly on the fire. You peel the bamboo down like a banana as you eat the rice from the center of the stalk. It seems easy enough to do at home on a grill. The moisture from the bamboo steams the rice as it roasts. We arrived at the Thai border and after clearing immigration, we had to switch to Thai buses and take a Thai guide with us. Once across the border to Thailand it was not only a different country, but a whole different world. We had to take a guide with us from the border, as Sky, our Cambodian guide couldn’t actually work in Thailand. As Thailand is a much more westernized country, along the highway we actually stopped at 7-11 for a snack break. There are more 7-11’s there than there are Starbucks in NYC! Our hotel in Bangkok was located in the backpacker district, where every shop along the streets were either a tattoo parlor, bar, t-shirt shop or fast food restaurant. Our final dinner as a full group was at a small restaurant near the hotel where we had a room to ourselves. We had a great time, plenty of food and good conversations. We then made a night of it and went bar hopping and ended up in a club with a Thai cover band singing 70’s classics. I had two more days in Bangkok as did several others from our group. 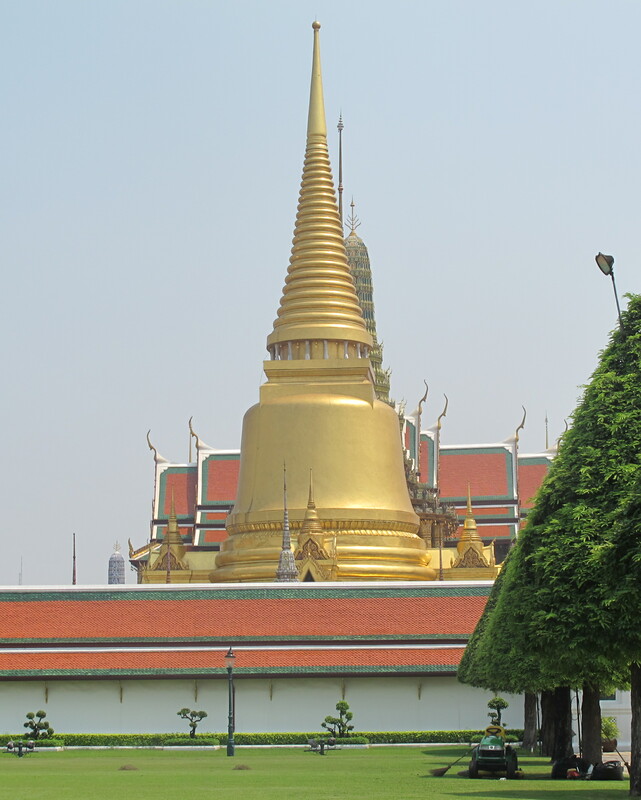 We visited the Royal Palace, took a Tuk-tuk tour around the city, and took the water bus down the Chao Phraya River. 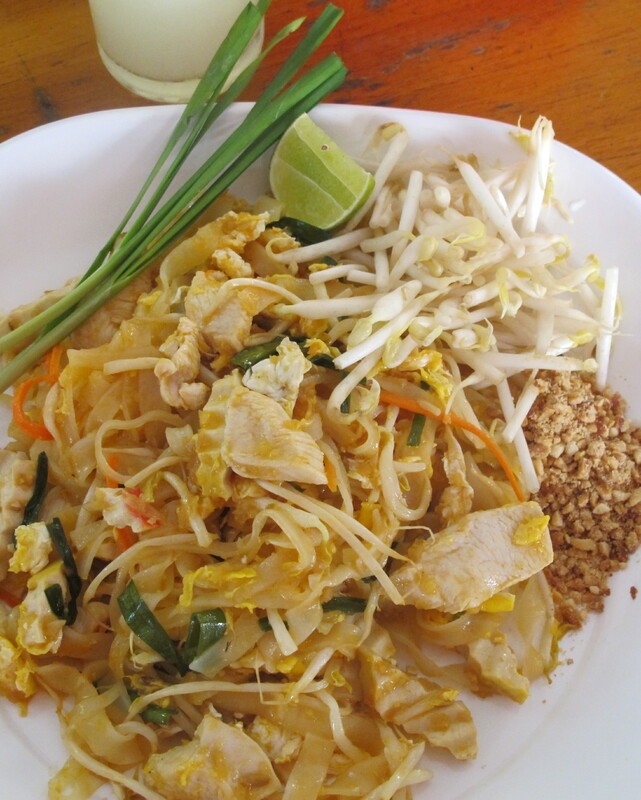 I visited several temples and I ate as much Pad Thai from the street vendors as I could. On the flight home I didn’t get to upgrade to Business Class but Coach on Cathay Pacific was pretty comfortable, especially since there was no one next to me. It was a long flight from Hong Kong to New York with a stop in Vancouver. This trip was definitely a trip of a lifetime. It opened a whole new world to me and I want to keep exploring- especially those places that are not so much tourist destinations, but are off the beaten path and experience life where the real people live. 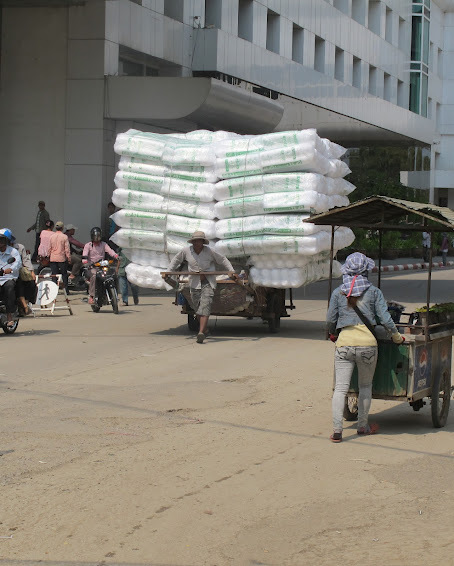 The bus from Ho Chi Minh to Phnom Penh was about a six hour ride. 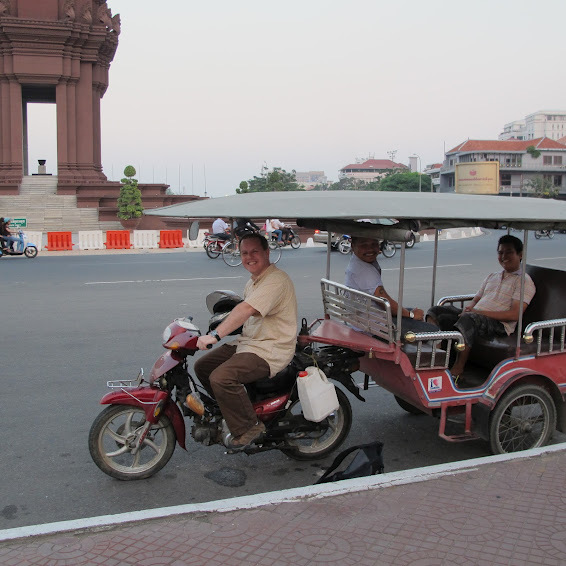 As soon as we arrived and settled in, we took a Tuk-tuk tour around the city. Tuk-tuks are a great way to travel around Phnom Penh as you see much more than you would from a car-and they are really inexpensive! 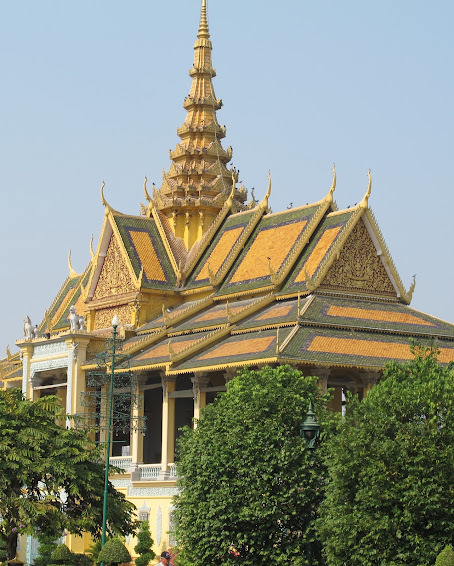 Phnom Penh is a growing city with a mixture of old beautiful French architecture and a mixture of Bauhaus and European post-modern architecture with traditional elements from Angkor. 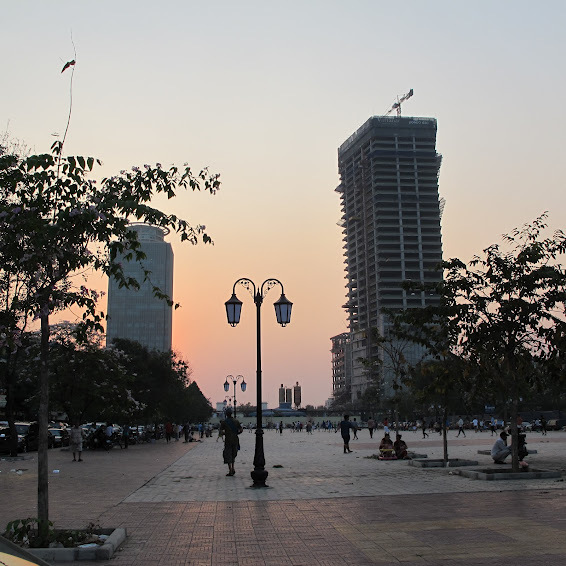 There are a few brand new buildings being built now, but mostly, the city is still recovering from the rein of the Khmer Rouge and is in a state of renovations. The Royal Palace was the first stops on our tour. It is a complex of buildings which has served as the royal residence of the kings of Cambodia since it was built in the 1860’s. It’s divided into three main compounds; the Silver Pagoda which houses national treasures such as gold and jeweled Buddha statues, the Moonlight Pavilion which serves as a venue for the Royal Dancers, a tribune for the King to address the crowds and as a place to hold state and Royal banquets, and finally the Throne Hall where weddings and coronations take place. We also saw the lotus shaped stupa, The Independent Monument which commemorates Cambodia’s independence from France in 1953. During national celebrations, The Independence Monument is the center of activities. We finished the tour with drinks at FCC, The Foreign Correspondence Club, overlooking the Mekong River. It was the perfect way to end our afternoon. 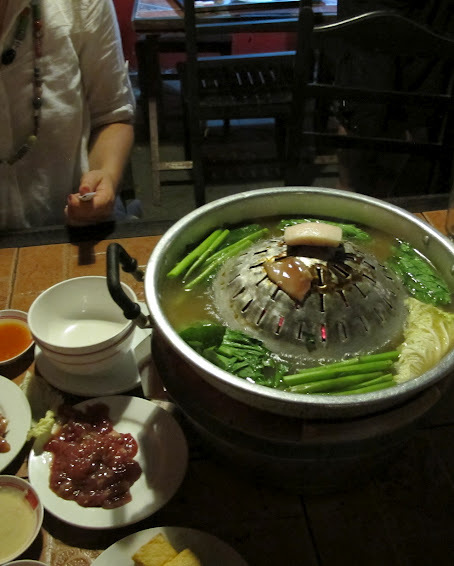 That first night in Phnom Penh, we had dinner at a very important and a very tasty place, Friends the Restaurant. 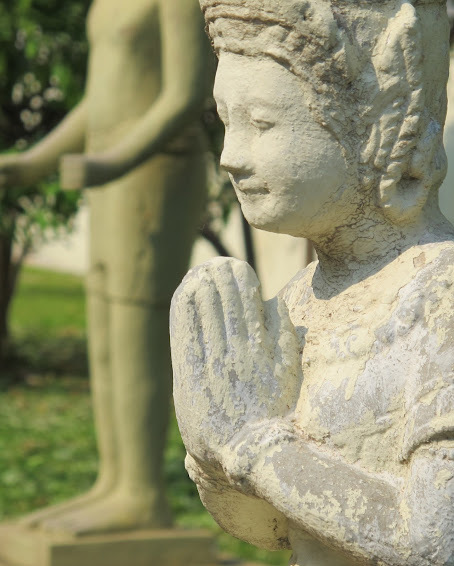 This restaurant is owned and operated by a local organization that works with Cambodian street children, their families and the surrounding community to develop projects that aides the children to become independent and productive members of the community. The restaurant itself helps fund the project and all of the staff are beneficiaries of the program. The Center, behind Friends the Restaurant, called Mith Samlanh offers food, shelter, medical care, training and educational facilities for over 1,800 homeless, vulnerable or abandoned children every single day. In addition to Friends the Restaurant, they have several other restaurants and cafes around the city. It’s a worthwhile stop on any trip to Phnom Penh. Plus, the Beef with Oyster Mushrooms was delicious and the Pineapple Chili Margarita was one of the best drinks I have ever tasted! The next day we all knew it would be the most somber day of the trip. 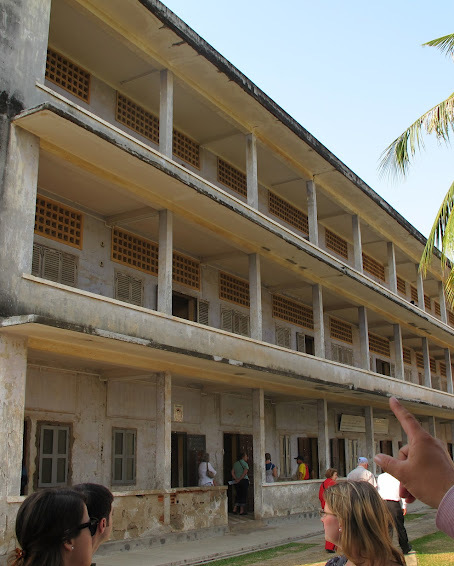 We started with a drive to the Tuol Sleng Genocide Museum, which was originally a high school complex but during the reign of Pol Pot was turned into a prison and torture center known as Security Prison 21 (S-21). 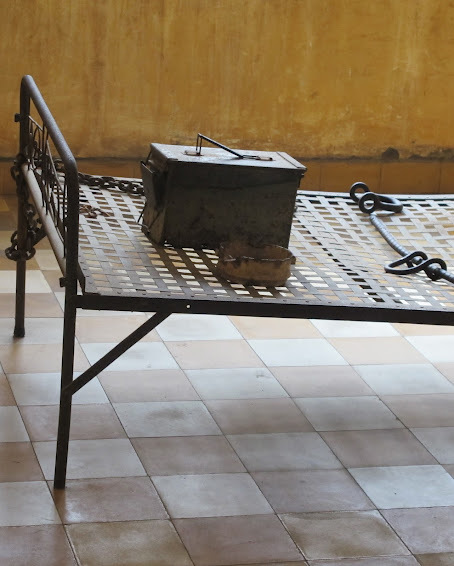 We toured the grounds, seeing the cells where the prisoners were held till they were sent to the killing fields to be executed. The most haunting part for me was seeing the rows and rows of photographs of the prisoners that line the walls inside the prison. 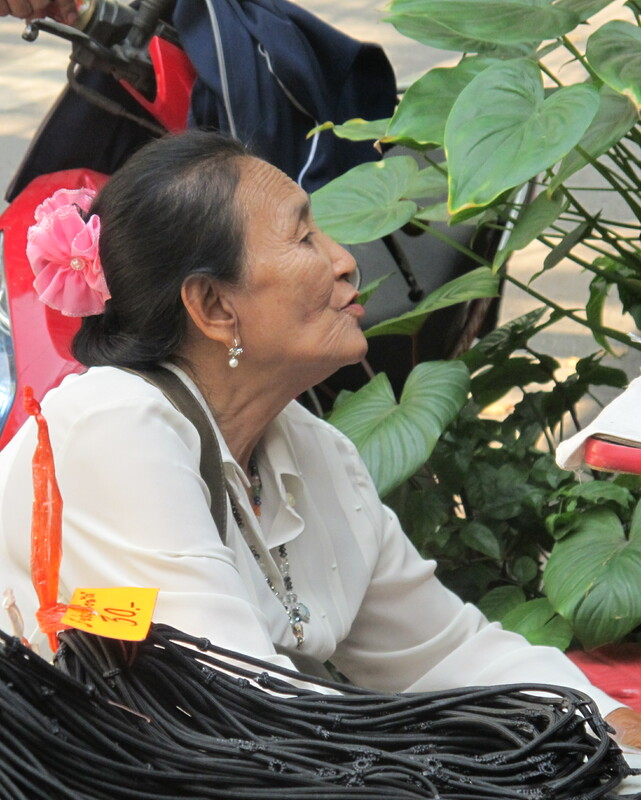 While at the prison, we had the privilege to meet one of the two living survivors from the original seven that were found at the time the prison was liberated by the Vietnamese Army. He shared his story and Sky, our guide, translated for us. It was really remarkable. 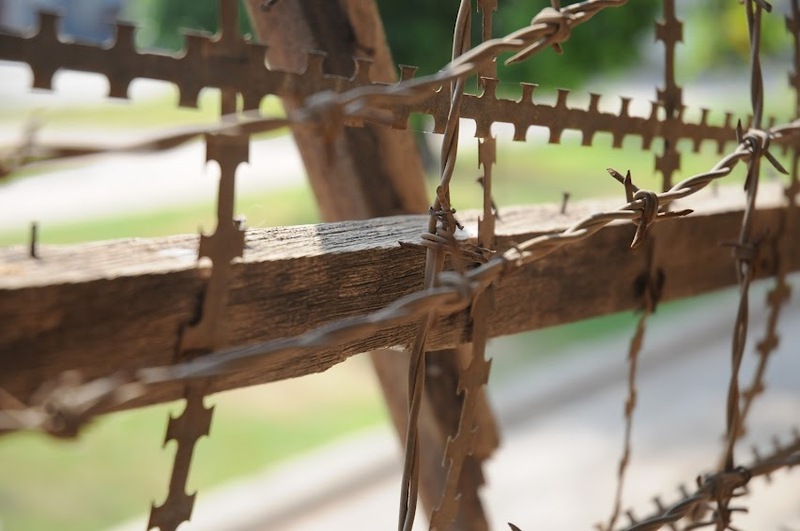 After the museum we drove out of the city, past dozens of textile factories, to the Killing Fields, where prisoners were driven to at night to be executed. At the center of the main field is a large Stupa, inside of which contains 17 levels of bones that were exhumed from the fields surrounding it. 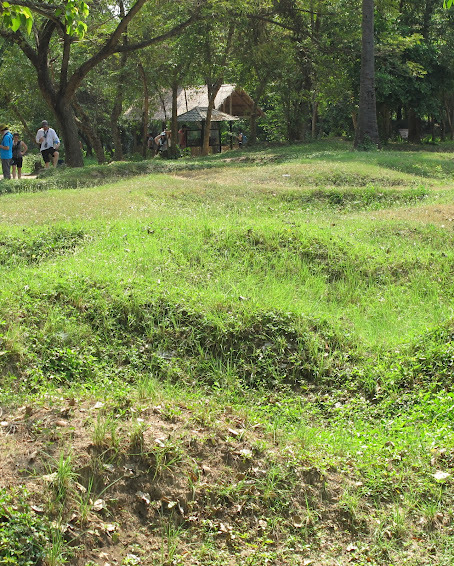 In all it is estimated about 30,000 men, women and children were executed at this location, which is one of dozens, if not hundreds of killing fields spread throughout the country. Near the center of the mass graves that are scattered around the main field stands a tree. This is the tree that babies and young children were pulled from their mothers arms and smashed against, and from this spot, even though I was almost 10,000 miles from home, I was giving my kids a huge hug. On the near silent bus ride back to the city they offered to stop at the Russian Market, so if anyone wanted to get off there and explore, we could, and make our way back to the hotel. Several of us did, wanting to ease the mood a bit. The front half of the market is a combination of t-shirt & Krama, the traditional Cambodian checkered scarf, vendors and booths. Continuing deeper into the market, aromas of the food stalls beckoned! In that dark building, lit only by the rays of the sun coming through dirty, broken skylights and a few bare bulbs hanging from wires, was stall after stall of traditional foods. Most of the cooking being done was performed in the same way it had been for centuries, over red hot coals in a stone pot. 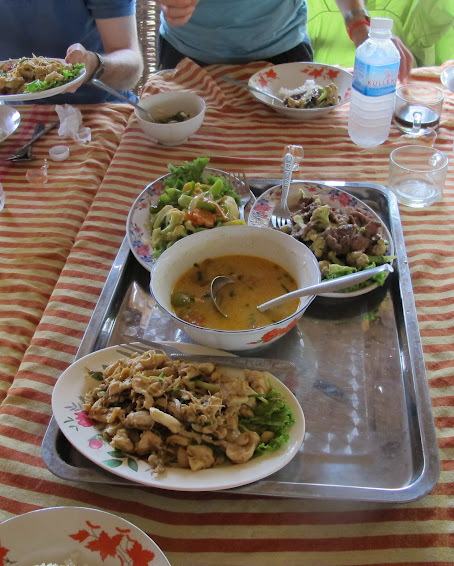 There were grilled meats, fried foods, and of course, noodle soups. 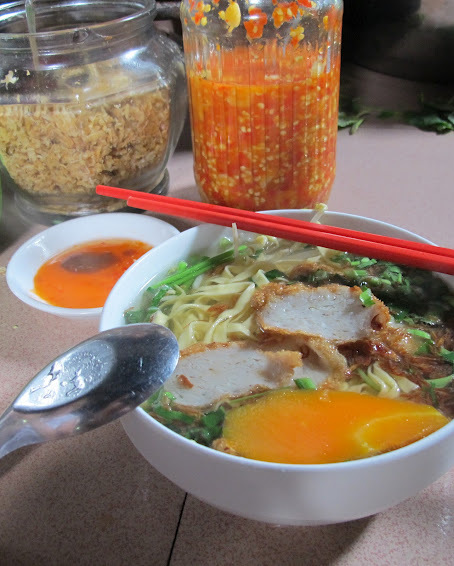 The cooking fires had heated the room to what felt like over 100 degrees, sitting at the counter on a low plastic stool I pointed out my order to the women behind the counter, a bowl of steaming broth with silky noodles vegetables and chicken. The bowl was served with a wedge of lime and there are about half a dozen other condiments on the counter, each spicier than the next. In the evening, prior to dinner, the group met again at the FCC for happy hour. Who could say no to $1 beers on a third floor balcony overlooking the Mekong and the hustle and bustle of Phnom Penh? Certainly not me! Dinner that night was one of the most special moments of the trip, as our guide, Sky, was taking us to a friend’s home. His friend teaches English to local neighborhood kids in the evenings and we had the opportunity to sit with the kids for over an hour, going over everything they learned, playing games, singing songs and just letting them practice their English and of course, ask all kinds of questions. 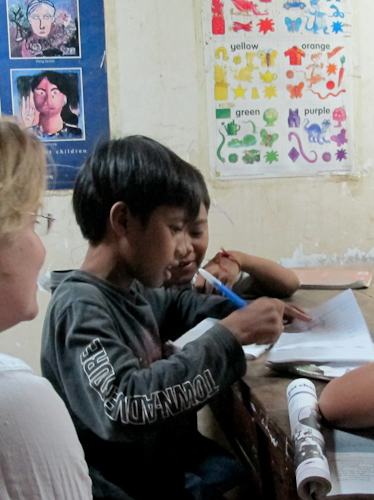 The kids ranged in age from 6-17 and they come to Sky’s friend’s house every evening to improve their English. We found out later that Sky used to teach there in exchange for a place to live. After our time with the children, we headed up to the house where set out on the floor was a crimson floor covering set for our dinner. We took our places on the floor and the feast began! Spring rolls, chicken soup, chicken curry, beef kabobs, fried noodles with beef, and stir fried vegetables were on the menu for the night. Everything was amazing! The food along with a few cans of the local Angkor beer made the evening pass way too quickly. Just as we were almost done, the power went out, leaving us to eat by the glow of cell phones until the generator kicked in and the lights came back. It was almost a disappointment when they did! We capped off the dinner with shots of spider wine. Yes, I said spider! 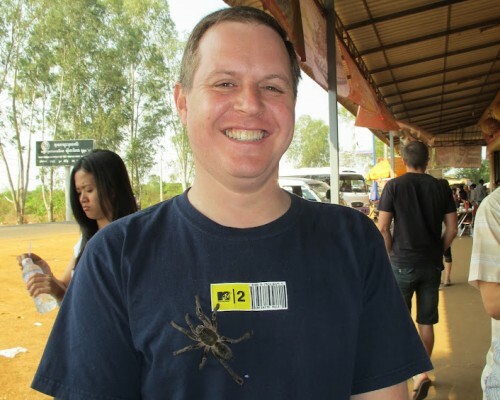 It’s basically rice whisky where live tarantulas are placed inside the bottle with the thought that when they drown, their secretion will add special qualities to the drink. Little did I know, this would be a preview for the next day’s adventure! 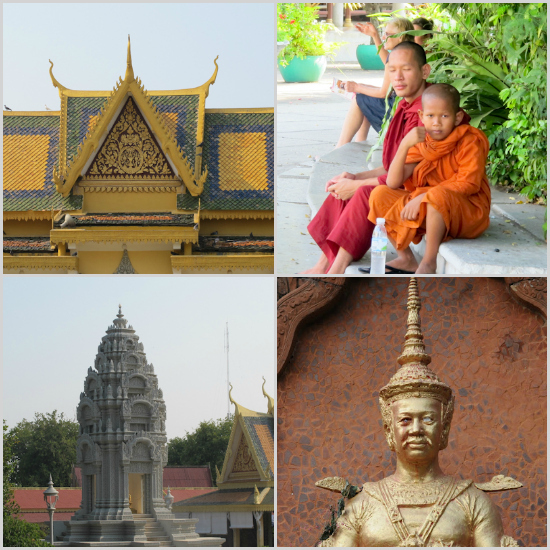 Wednesday dawned and we said good bye to Phnom Penh and set off towards Siem Reap. 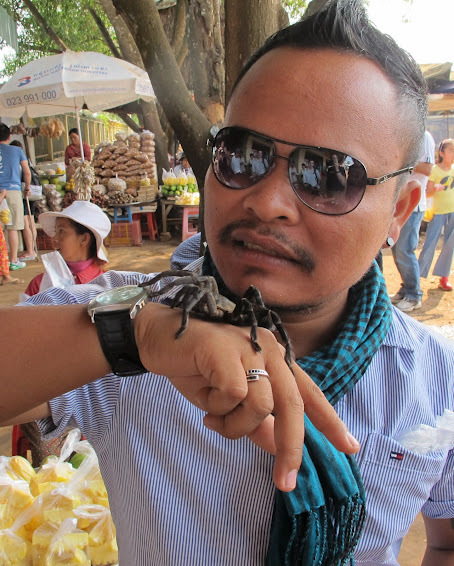 Our first stop on the road was at “Spider Town”, where they are known for their deep fried tarantulas in garlic oil. 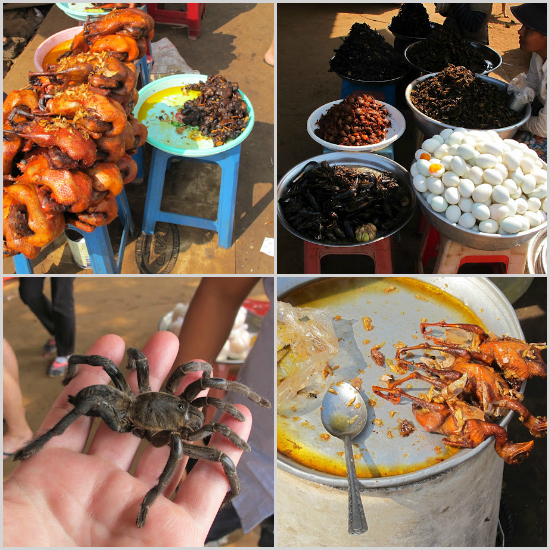 If that didn’t whet your appetite, they also had crickets, water bugs, frogs, whole sparrows, and baby ducks- each cooked differently and in the local custom. Sky was kind enough to buy us some samples to try! The consensus on the bus was that crickets were the favorite, followed by the spiders. The only problem with the spiders was the hairs that stuck in your teeth after. I did not try any of these! 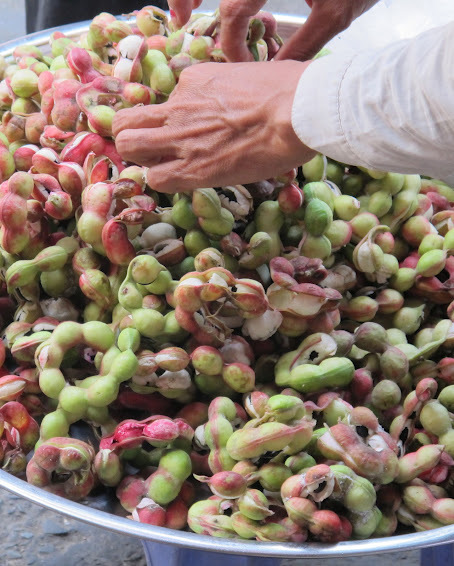 Thankfully, he also bought us some fruits, which I did try. 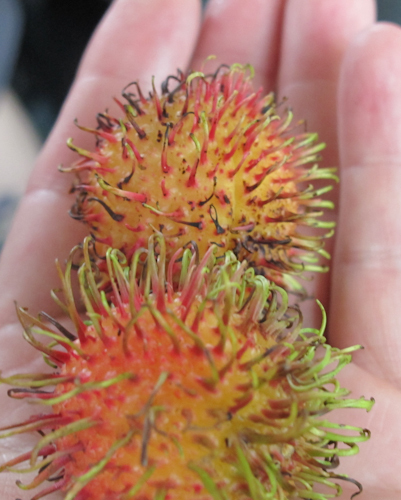 The rambutan, sugar cane and lychee were delicious. A stop at a roadside restaurant for a plate of fried noodles with beef was a welcome “real” lunch! 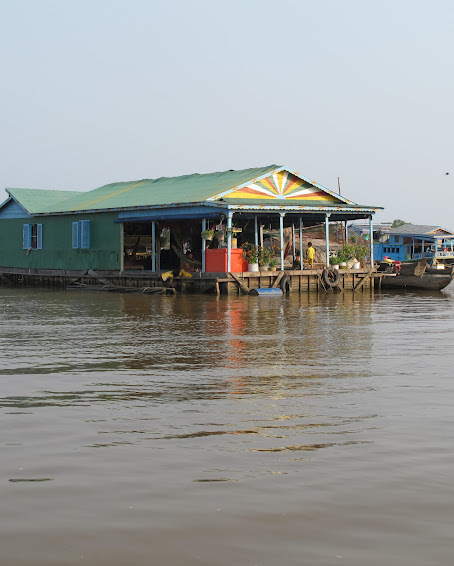 We continued on to Tonle Sap Lake to visit one of the floating villages there. Passing through a local fishing village, two things stood out- one, how incredibly simply people can live and still be so happy and welcoming. And two, that even though most of the houses were on stilts at least 20 feet over the level of the lake’s water, they were under water during the flooding last fall! 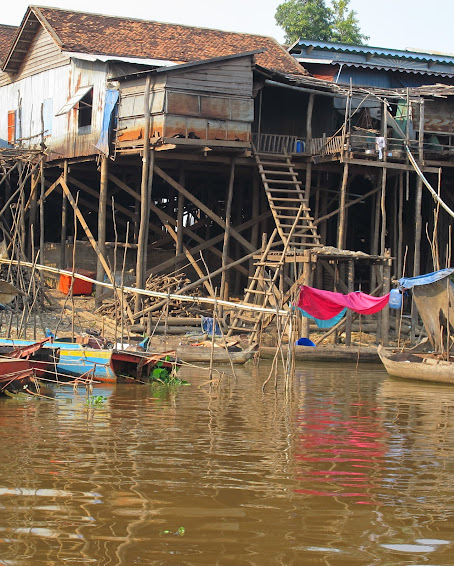 We then walked through a fishing village where the local children curiously followed us as we re-boarded the bus for the final leg to Siem Reap. After settling in and a quick change, it was off to dinner at the Golden Temple Restaurant for some spring rolls and a chicken noodle dish with a show of traditional Khmer dancing. We ordered a lot of beer there because it’s actually cheaper than soda and we enjoyed the dancing and colorful costumes. It was a fun, touristy place to dine. After dinner, we went off to explore the Angkor Night Market and then it was back to the hotel for a good night’s sleep.